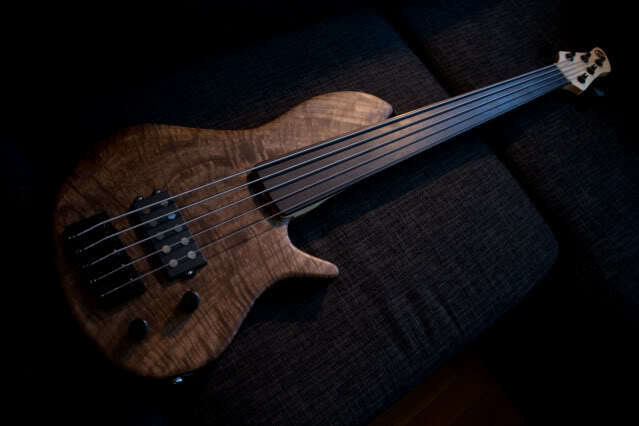 All the basses I build are custom instruments with various wood combinations and hardware options. I think it is really exciting when my customers approach me with a dream bass and ask me to build it for them. In the process, we decide on hardware, wood selection, and so on. As a consequence, the price of the bass will be highly dependent on the options selected. Finish: Satin polyurethane finish on Spanish cedar and similar, oil finish on Mahogany, Swamp Ash, Black Limba, Walnut and similar. Depending on other options (or simplifications) the quote for your custom bass may differ from the base price listed above. Please look below for a list of available options. The list is not complete, so if you have other options you’d like for your bass, please contact me! Wenge and Hard Maple are available as stringers for necks. All the prices on this page are subject to change. Please contact me for a custom quote on your bass. All quotes are valid for 1 month from the day of reception of the offer. Just as every bass player is unique, the instrument of their desires will also be unique. I’ll be happy to work with you on fulfilling your bass desires. So please get in touch with me and let me know what the bass of your dreams looks like. Please look over the basses I have done and try and give me as much information as you can so I will be able to get you a more acurate price quote. Looking forward to hearing from you!